Want to make it easier for customers to learn more about your products and add them to the cart? If so, you’ll need our latest WordPress plugin – WooCommerce Quick View Pro. Launched today, it’s the easiest way to add product quick view popups or lightboxes to any WooCommerce store. 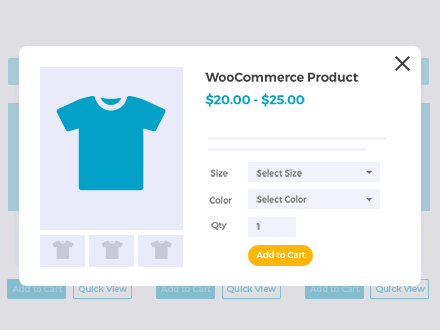 You can choose what information to display in the WooCommerce quick view – like opting to only include images, product details, or both. This means that you can use it as a WooCommerce add to cart popup plugin, letting customers choose variations and product options from the quick view. You can use it as a way to bypass the single product page. You can even use it as a standalone WooCommerce gallery lightbox plugin, showcasing the full product image gallery in a popup with zoom features. 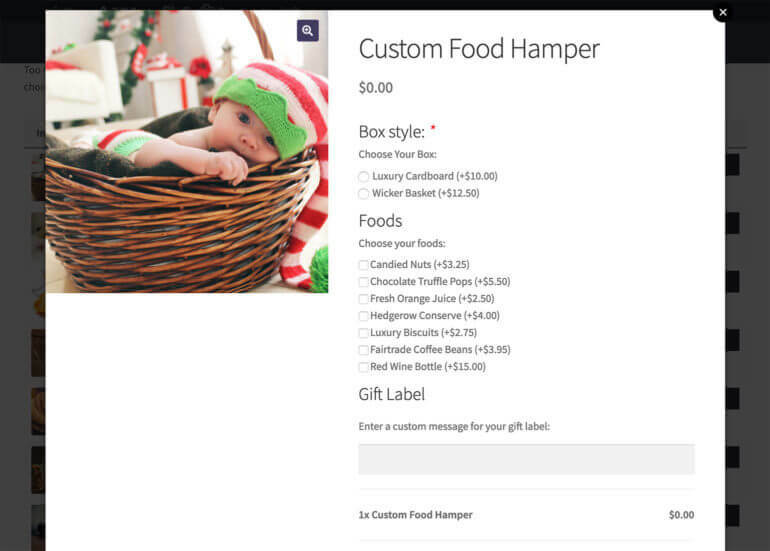 And you can also control how shoppers open the product quick view, like adding a quick view button or opening the quick view when a shopper clicks on the product title or image. First, let’s look at the benefits of a WooCommerce quick view plugin and how it can help different types of e-commerce store. Then, we’ll show you how to use the WooCommerce Quick View Pro plugin to add quick view functionality to your regular WooCommerce shop pages, or any product lists that you’ve created with our WooCommerce Product Table plugin. ForeSee found that the latter implementation was more effective in getting customers to use quick view, but you’ll still see both approaches. 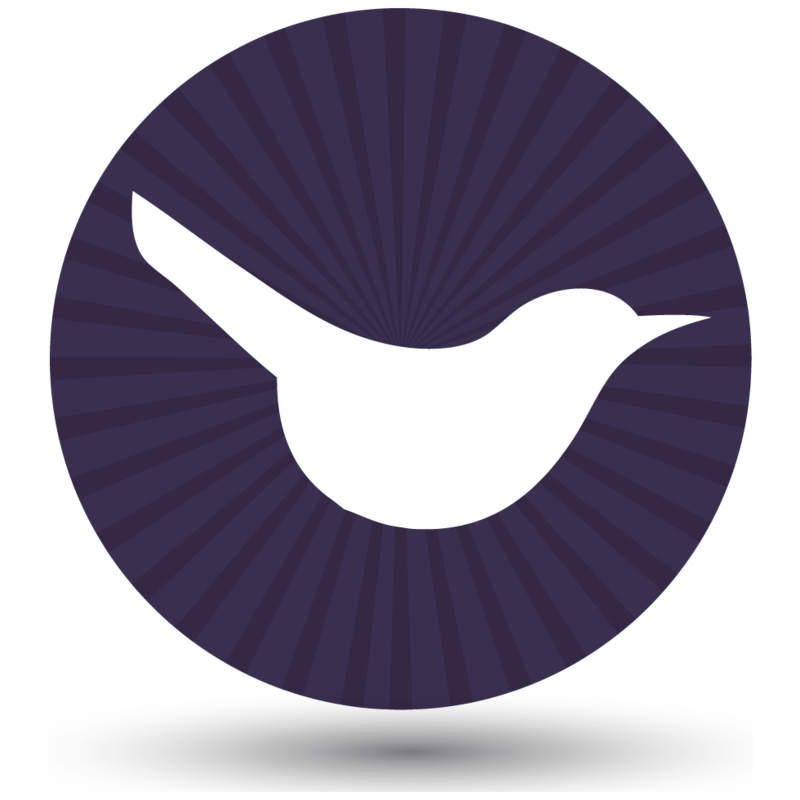 Note – WooCommerce Quick View Pro, our WooCommerce product quick view plugin, uses the recommended “click” approach. That’s why it’s so effective at increasing your sales. And for an actual WooCommerce quick view plugin demo, you can check out our demo page. Overall, product quick views are a popular tactic that’s used by 48% of the top-50 US eCommerce sites, according to the Baymard Institute. Next, we’ll share some use cases for when a WooCommerce quick view plugin is a good idea. After that, we’ll show you how to add quick view to your store. A WooCommerce quick view plugin is the perfect way to present additional information without taking up more space or sending users to a separate product page. Because the information is hidden until a customer actually needs it (i.e. they click a button or link to open the quick view), it doesn’t clutter up your product lists. Most WooCommerce product list views show a single image for each product. The best WooCommerce quick view plugins let you create a product gallery lightbox. Shoppers can browse all your product images. They can view the full gallery and enjoy extra features like image zoom, without loading a new page. Additionally, customers can quickly switch between the gallery lightboxes for different products. This helps them make a decision. This approach works whether you’re using the regular WooCommerce shop and category pages, or a WooCommerce list view plugin. Reviews add important social proof to your products. However, you normally have to get a shopper to go to the individual product page before you can show them the average star rating for each product. However, with a product quick view WooCommerce plugin, you can display reviews right away. This puts your social proof front and center. If you’re using WooCommerce as a restaurant ordering system, you probably know the struggle of trying to balance presenting a clean, easy-to-read menu with giving your customers the ability to customize their food orders. For example, if you have a pizza delivery shop, you might have 10+ different toppings that customers can choose from, which can get cluttered on a standard WooCommerce list view menu. With a WooCommerce quick view plugin, you can present a clean, easy-to-navigate menu and then let customers customize their order using the product quick view. You’ll still get that nice one-page ordering that restaurants need, but you won’t have to compromise on usability. If you let customers build their own products with WooCommerce, you might have too many configuration options to display in your product list. Like the restaurant example above, a WooCommerce quickview plugin lets you offer all those options while still keeping your product list organized. Display information from third-party plugins, like deposits, subscriptions, etc. Many third-party plugins add their own information to the add to cart section of a product page. Common examples are Deposits, Variation Swatches, and Subscriptions. These extras won’t display on the default WooCommerce shop or category pages. They’re normally only available on the single product page. However, WooCommerce Quick View Pro plugin supports a long list of third party plugins, including all of the ones mentioned above. 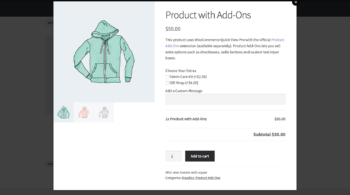 The extra product options appear in the WooCommerce quick view product popup. As a result, your main shop page remains clean while still letting visitors access the important information from the same page. A WooCommerce quick view plugin is a great option for displaying product add-ons, attributes and variations. If you want to display Product options as a popup window, then this is the best quick view plugin for you. The quick view lightbox lets you display more information about each product as well as extra buying options – all without having to visit the individual product page. 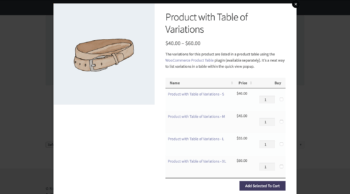 You can even display product variations as a table in the quick view by using WooCommerce Quick View Pro with our WooCommerce table plugin. Learn how to display variations as a table on the single product page/quickview. If you use audio or video playlists at your store (either as actual products or as supplemental product information), you can display an individual media player or a full playlist in the WooCommerce quick view plugin lightbox. All you need to do is add a media player to the popup product short description. You can also display audio or video media players directly in your product list, if desired. We have some dedicated posts for audio and video, as well as a tutorial on how to create a WooCommerce audio store. 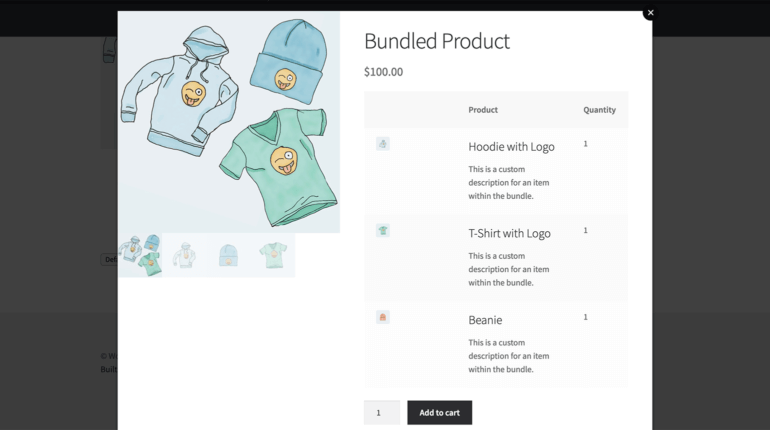 By default, your shop page or product list displays each individual product, even if it’s part of a product bundle or group. With the WooCommerce Quick View Pro plugin, though, you can display grouped products via the native WooCommerce functionality. This WP plugin also supports product groupings that you’ve created with the Bundled Products or Composite Products plugins. You can get pretty creative with these configurations, as explained in this article. WooCommerce Quick View Pro is a WordPress quick view plugin. It makes it easy to add quick view features to any Woo store. You can use it with the regular WC shop and category pages. 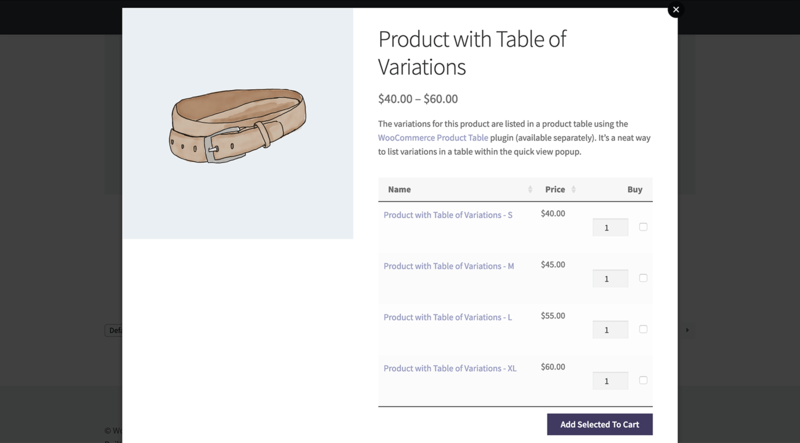 Or, WooCommerce Quick View Pro also integrates with our WooCommerce Product Table plugin for products that sell best when listed in a table view. WooCommerce Quick View Pro is built to follow the best usability practices. Rather than displaying the quick view on hover, WooCommerce Quick View Pro uses a persistent button to open the quick view. (Or, you can also let shoppers click on the regular product title/image). Lets you customize what information displays in the quick view. For example, you can choose to only display images, or to only display certain product details – or both. You have full control over the specific product data that displays in the quickview lightbox. Is responsive. The quick view popup works on all devices and shoppers can open the quick view with any touch screen. Integrates with the WooCommerce Product Table plugin. This lets you add quick view to the order forms that you create with WooCommerce Product Table. Works with all WooCommerce product types. Simple products, variable products, external/affiliate products, grouped products… your customers can buy any of these from the quick view modal window. Integrates with other popular WooCommerce plugins, including Product Add-ons, WooCommerce Product Bundles, WooCommerce Deposits, WooCommerce Subscriptions, WooCommerce Wishlist Plugin, and more. When a shopper adds a product to their cart from the quick view, the plugin automatically closes the quick view box and shows a success message. This encourages people to keep browsing and purchase additional products. Alternatively, you can use the native WooCommerce “Redirect to the cart page after successful addition” feature to send shoppers straight to their carts. 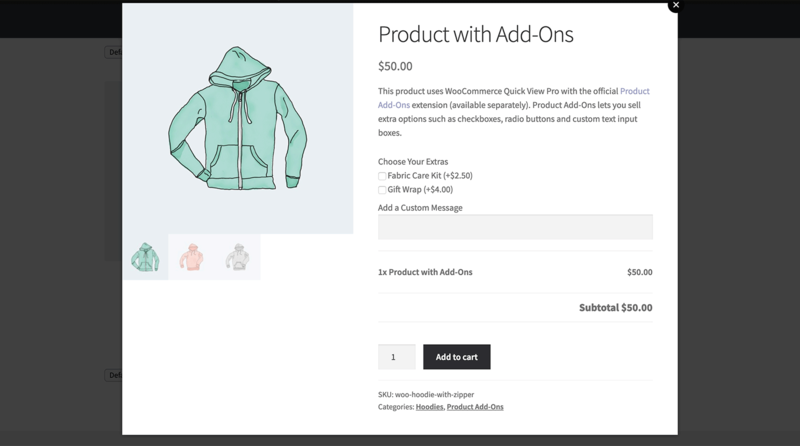 You can see WooCommerce Quick View Pro in action at our working WooCommerce quick view demo. As soon as you install and activate the WooCommerce Quick View Pro plugin on your WooCommerce store, it automatically adds product quick view features right away. By default, it adds a new Quick View button to the main shop page and category archives. Those are the defaults – now, here’s how to customize how the WooCommerce quick view plugin works. The first setting that you’ll want to configure is how shoppers actually open the quick view popup. Beyond that, you can also choose whether or not to open the quick view when a shopper clicks on the product’s title or image. You can do much more than choosing how shoppers open the WooCommerce product quick view box. Beyond this, you can also control what product information displays inside the quick view box. And even further, you can choose how shoppers can interact with that information. Next, let’s cover how to use the WooCommerce quick view plugin with our WooCommerce Product Table WordPress plugin. WooCommerce Quick View Pro is built to integrate with WooCommerce Product Table. It replaces all links to the single product page with quick view. As a result, customers can’t get from the table to the single product page. It’s perfect if you want to disable the individual product page completely. If you want to change the button text, you can use regular WooCommerce Quick View Pro button settings. You can also use those settings to customize what information is included in the product quick view box. eCommerce quick views are a great way to let shoppers view more information without forcing them to visit the individual product page. Almost half of the top 50 eCommerce stores have implemented quick view functionality. 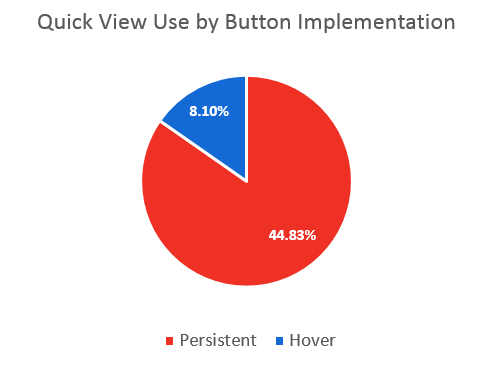 About 45% of shoppers are likely to make use of quick view functionality. It doesn’t matter whether you’re using the regular WooCommerce shop pages or you’ve created product list views with our WooCommerce Product Table plugin. Either way, WooCommerce Quick View Pro adds a flexible product quick view box in just a few minutes. We’ve designed it to be the best quick view plugin available today, and we hope you like it. Do you have any questions about how to use a WooCommerce quick view plugin at your store? Let us know in the comments!